Supporters of Egyptian president say they have collected more than 12 million signatures from people urging him to run for another term. Supporters of Egyptian President Abdel Fattah Al-Sisi announced on Sunday that they have collected more than 12 million signatures from people urging him to run for another four-year term, The Associated Press reports. He has yet to formally announce his candidacy for a second term and has said he will make his decision after gauging popular reaction to a "factsheet" of his achievements due to be publicized next month. If Sisi does run and win, it would appear it would be his last term in office. Last month, he told CNBC in an interview that he would not seek a third term in office, noting the country's constitution permits its leaders to serve only two four-year terms. Mohammed el-Garhy, the chief coordinator of the group that gathered the signatures, told a news conference Sunday that "the supreme goal of our campaign is to safeguard the Egyptian state." He was alluding to the widespread conviction among Sisi’s supporters that his policies since 2013 have protected Egypt from the chaos and bloodshed seen in fellow Arab countries like Libya, Yemen or Syria. The group has carried out a large-scale publicity campaign, with giant posters of the president looming over some of Cairo's busiest roads. The group is called "So You Can Build It (Egypt)," a play on the mega projects that Sisi has undertaken since assuming office. These include the expansion of the Suez Canal, the construction of new cities, including a new administrative capital east of Cairo, a network of roads and low and middle-income housing projects. 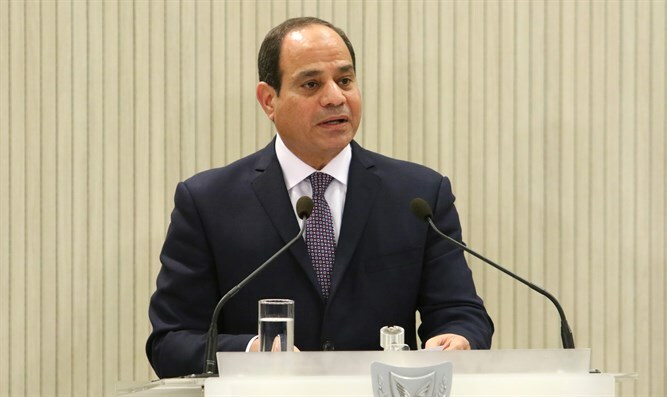 Sisi has also introduced ambitious and politically risky economic reforms, including the floatation of the Egyptian currency, a VAT tax and a reduction of subsidies on fuel and utilities like electricity and water. For now, it appears as though Sisi will have at least one challenger for the presidency. Former Egyptian Prime Minister Ahmed Shafiq, who also ran against Morsi in 2012 and lost, recently announced he would run in 2018. Shafiq later returned to Egypt from the United Arab Emirates, where he had fled after losing the 2012 election.